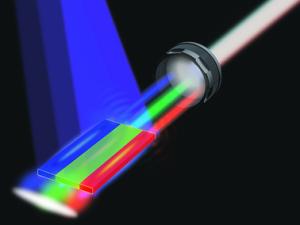 Researchers at Arizona State University have created white laser light with an array of semiconductor lasers in a compact arrangement. The project helps pave the way toward better lighting and light-based wireless communication, as white lasers are more luminous and energy efficient than LEDs. ASU researchers created a novel nanosheet — a thin layer of semiconductor that measures roughly one-fifth of the thickness of human hair in size and roughly one-thousandth the thickness of human hair — with three parallel segments, each supporting laser action in one of three elementary colors. The device is capable of lasing in any visible color, completely tunable from red, green to blue or any color in between. When the total field is collected, a white color emerges. Engineers in ASU’s Ira A. Fulton Schools of Engineering published their findings in the July 27 advance online publication of the journal Nature Nanotechnology. Cun-Zheng Ning, professor in the School of Electrical, Computer and Energy Engineering, wrote the paper, “A monolithic white laser,” with his doctoral students Fan Fan, Sunay Turkdogan, Zhicheng Liu and David Shelhammer. The advance puts lasers a step closer to being a mainstream light source and potential replacement or alternative to light emitting diodes. Lasers are brighter, more energy efficient, and can potentially provide more accurate and vivid colors for displays like computer screens and televisions. Ning’s group has already shown that their structures could cover as much as 70 percent more colors than the current display industry standard. Another important application could be in visible light communication in which the same room lighting systems could be used for illumination and communication. The technology under development is called Li-Fi for light-based wireless communication, as opposed to the more prevailing Wi-Fi using radio waves. Li-Fi could be more than 10 times faster than current Wi-Fi, and white laser Li-Fi could be 10 to 100 times faster than LED based Li-Fi under development. Sandia National Labs in 2011 produced high-quality white light from four large lasers. The researchers showed that the human eye is as comfortable with white light generated by diode lasers as with that produced by LEDs, inspiring others to advance the technology. Semiconductors, usually a solid chemical element or compound arranged into crystals, are widely used for computer chips or for light generation in telecommunication systems. They are used to make lasers and LEDs because they can emit light of a specific color when a voltage is applied to them. The most preferred light emitting material for semiconductors is indium gallium nitride, though other materials such as cadmium sulfide and cadmium selenide also are used for emitting visible colors. The main challenge lies in the way light emitting semiconductor materials are grown and how they emit light of different colors. Typically a semiconductor emits light of a single color — blue, green or red — that is determined by a unique atomic structure and energy bandgap. The “lattice constant” represents the distance between the atoms. To produce all possible wavelengths in the visible spectral range you need several semiconductors of different lattice constants and energy bandgaps. “Our goal is to achieve a single semiconductor piece capable of laser operation in the three fundamental lasing colors. The piece should be small enough so that people can perceive only one overall mixed color instead of three individual colors,” said Fan. — Sharon Keeler, chief media officer, Ira A. Fulton Schools of Engineering. Read more about the research here.